Russia’s unusual thermobaric rocket launcher has proliferated to another country. 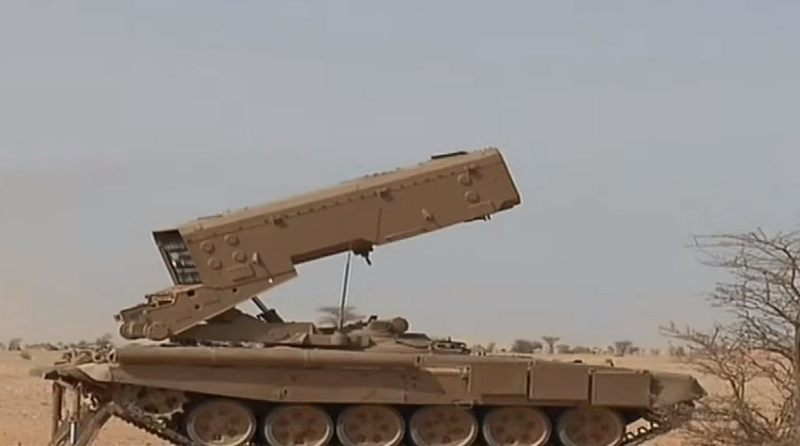 In use in Russia, Kazakhstan, Azerbaijan, Iraq and Syria — the enormous tracked launcher is now in service in Algeria, according to imagery revealed on Algerian television. The TOS-1A Buratino is named after a Tolstoy adaptation of “Pinnochio,” given the long turret. The turret is actually an enormous steel box of 24 individual tubes containing 220-millimeter thermobaric rockets filled with fuel-air explosives that can devastate an area within 300 meters through a combination of heat and overpressure. The rockets emit an aerosol which then ignites in a blast, sucking the oxygen out of a person’s lungs. Horrific as it is, the TOS-1A is effective at killing in close quarters such as entrenchments and urban areas. Iraqi TOS-1As went to battle most recently in the Old City of Mosul. Azerbaijan deployed the launchers during an eruption of fighting with Armenia in 2016. The short range of the TOS-1A’s rockets — 3,500 or 6,000 meters depending on the type of rocket used — makes the weapon vulnerable compared to most other forms of heavy artillery. The Buratino must get relatively close to the front line. The vehicle is somewhat protected with an armored T-72 tank chassis acting as the launcher’s base. But a direct hit to the high-profile launcher itself could set off a devastating explosion. Algeria’s purchase of TOS-1As is part of a large-scale modernization for what is one of the largest and best-funded armies in Africa that has sporadically fought with Islamist insurgents since the Algerian Civil War diminshed in the early 2000s. Algeria continues to support the Polisario Front which seeks to expel Moroccan troops from Western Sahara. The first of Algeria’s Buratinos, however, appear to be deployed near the Libyan border. Photos appeared in the Russian press in February 2018 of the TOS-1As under construction at their Uralvagonzavod plant in Omsk. There were 16 vehicles on the assembly line and — judging from their appearance — received a special coat of radar-absorbent paint. But a bulky tank chassis with a missile launcher on the top is hard to hide.